United States midfielder Julie Ertz tries to control a loose ball with England's Fran Kirby in pursuit. NASHVILLE, Tenn. (AP) — Tobin Heath scored off her own rebound in the 67th minute, and the United States tied England 2-2 on Saturday in the SheBelieves Cup for the Americans' second draw in two games in the tournament. The Americans nearly pulled out a victory. Julie Ertz's header went off the bar at the end of the 77th minute, and they had a flurry of passes deep in the 90th minute without a shot on net. Japan beat Brazil 3-1 in the opening match of Saturday's doubleheader in the second part of this round-robin tournament featuring four of the world's top 10 teams. 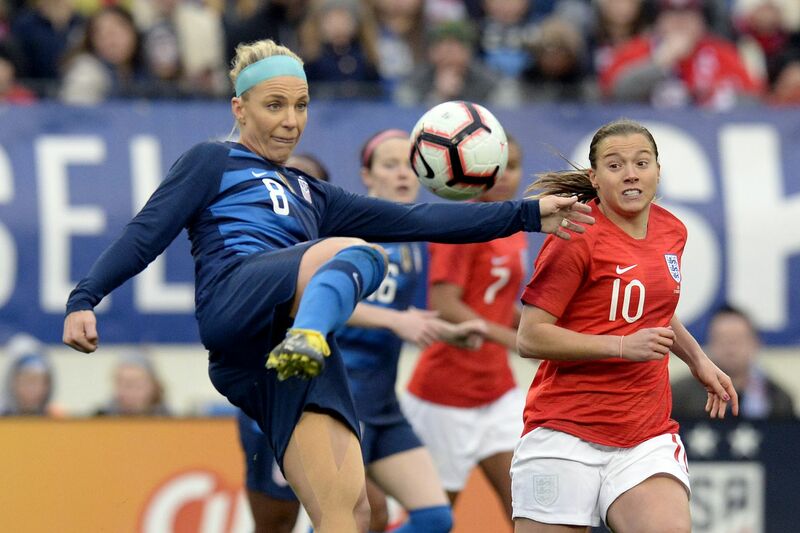 This tuneup for the Women's World Cup, which starts June 7 in France, concludes Tuesday night in Tampa, Florida, where the United States will play Brazil, while England plays Japan. The Americans are 3-0-1 at Nissan Stadium, home of the NFL's Tennessee Titans, this time before a crowd of 22,125 on a cloudy, chilly day. Kelley O'Hara passed the ball into the box where Daly tried to clear with a header. Rapinoe corralled the ball, then boomed a volley over the head of keeper Karen Bardsley for a 1-0 lead. Houghton tied it up on a free kick, curling the ball past the outstretched arms of goalkeeper Adrianna Franch in her first cap for the Americans. Rikako Kobayashi scored on a header in the 81st minute, and Japan beat Brazil 3-1 Saturday in the SheBelieves Cup tournament. Japan scored twice in the final 10 minutes to close out the win in the round-robin tuneup for the Women's World Cup in June. Yui Hasegawa padded the lead in the 85th minute, putting the ball into the right corner. Yuka Momiki scored in the 44th minute on a pass from Emi Nakajima, chipping the ball over Aline for a 1-0 lead. Debinha tied it up in the 57th minute, getting the ball away from a Japanese defender before sending the ball into the net. Japan, which lost the 2015 World Cup final to the United States, currently is ranked No. 8 in the world and tied the United States 2-2 in its tournament opener. Japan plays England on Tuesday night when the tournament moves to Tampa, Florida.